Like most things in life, taking the time to plan ahead when building a Web service can help in the long run. Open source software has become a fundamental building block for some of the biggest websites. And as those websites have grown, best practices and guiding principles around their architectures have emerged. This article seeks to cover some of the key issues to consider when designing large websites, as well as some of the building blocks used to achieve these goals. This article is largely focused on Web systems, although some of the material is applicable to other distributed systems as well. What exactly does it mean to build and operate a scalable Web site or application? At a primitive level it's just connecting users with remote resources via the Internet — the part that makes it scalable is that the resources, or access to those resources, are distributed across multiple servers. Availability: The uptime of a website is absolutely critical to the reputation and functionality of many companies. For some of the larger online retail sites, being unavailable for even minutes can result in thousands or millions of dollars in lost revenue, so designing their systems to be constantly available and resilient to failure is both a fundamental business and a technology requirement. High availability in distributed systems requires the careful consideration of redundancy for key components, rapid recovery in the event of partial system failures, and graceful degradation when problems occur. Performance: Website performance has become an important consideration for most sites. The speed of a website affects usage and user satisfaction, as well as search engine rankings, a factor that directly correlates to revenue and retention. As a result, creating a system that is optimized for fast responses and low latency is key. Reliability: A system needs to be reliable, such that a request for data will consistently return the same data. In the event the data changes or is updated, then that same request should return the new data. Users need to know that if something is written to the system, or stored, it will persist and can be relied on to be in place for future retrieval. Scalability: When it comes to any large distributed system, size is just one aspect of scale that needs to be considered. Just as important is the effort required to increase capacity to handle greater amounts of load, commonly referred to as the scalability of the system. Scalability can refer to many different parameters of the system: how much additional traffic can it handle, how easy is it to add more storage capacity, or even how many more transactions can be processed. Cost: Cost is an important factor. This obviously can include hardware and software costs, but it is also important to consider other facets needed to deploy and maintain the system. The amount of developer time the system takes to build, the amount of operational effort required to run the system, and even the amount of training required should all be considered. Cost is the total cost of ownership. Each of these principles provides the basis for decisions in designing a distributed Web architecture. However, they also can be at odds with one another, such that achieving one objective comes at the cost of another. A basic example: choosing to address capacity by simply adding more servers (scalability) can come at the price of manageability (you have to operate an additional server) and cost (the price of the servers). When designing any sort of Web application it is important to consider these key principles, even if it is to acknowledge that a design may sacrifice one or more of them. When it comes to system architecture there are a few things to consider: what are the right pieces, how these pieces fit together, and what are the right tradeoffs. Investing in scaling before it is needed is generally not a smart business proposition; however, some forethought into the design can save substantial time and resources in the future. This discussion is focused on some of the core factors that are central to almost all large Web applications: services, redundancy, partitions, and handling failure. Each of these factors involves choices and compromises, particularly in the context of the principles described previously. In order to explain these in detail it is best to start with an example. At some point you have probably posted an image online. For big sites that host and deliver lots of images, there are challenges in building an architecture that is cost-effective, highly available, and has low latency (fast retrieval). Imagine a system where users are able to upload their images to a central server, and the images can be requested via a Web link or API, just like Flickr or Picasa. For the sake of simplicity, let's assume that this application has two key parts: the ability to upload (write) an image to the server, and the ability to query for an image. While we certainly want the upload to be efficient, we care most about having very fast delivery when someone requests an image (for example, images could be requested for a Web page or other application). This is very similar functionality to what a Web server or Content Delivery Network (CDN) edge server (a server CDN uses to store content in many locations so content is geographically/physically closer to users, resulting in faster performance) might provide. There is no limit to the number of images that will be stored, so storage scalability, in terms of image count needs to be considered. There needs to be low latency for image downloads/requests. If a user uploads an image, the image should always be there (data reliability for images). The system should be easy to maintain (manageability). Figure 1 is a simplified diagram of the functionality. 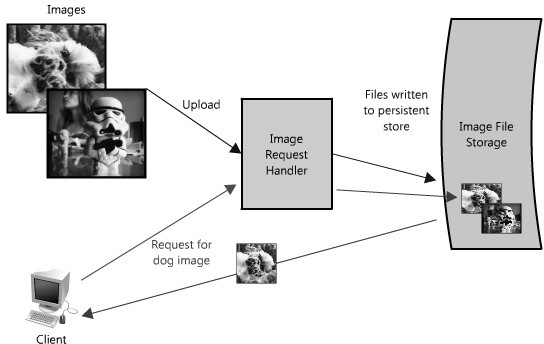 Figure 1: Simplified architecture diagram for image hosting application. In this image hosting example, the system must be perceivably fast, its data stored reliably and all of these attributes highly scalable. Building a small version of this application would be trivial and easily hosted on a single server; however, that would not be interesting for this article. Let's assume that we want to build something that could grow as big as Flickr.